Identify the primary benefits of metal cladding and roofing systems and how they can be applied to achieve striking aesthetics for a variety of facility types. Better understand how BIM actively supports the metal design, fabrication and construction process. Explain how insulated metal panel and rainscreen systems work. Identify the advantages of metal roofing systems and gain some installation insights. Highly flexible, recyclable, durable and long-lasting, metal cladding and roofing systems offer an extensive range of aesthetic possibilities and streamlined construction. In fact, steel is reported to be the number one recycled material in North America, with both steel and aluminum experiencing little to no degradation during recycling. In addition to avoiding the landfill and finding life in new products, metal architectural panels themselves are fabricated from recycled materials, anywhere between 25 percent and 95 percent, making them highly sustainable. 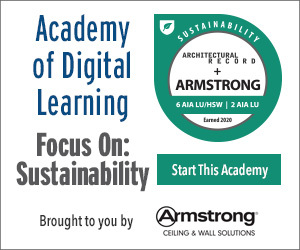 While the list of benefits of designing with steel is lengthy, Mark McVay, RA, LEED AP, design principal, SmithGroupJJR, Los Angeles, classifies metal’s strength-to-weight ratio – as compared to stone, concrete, glass and cementitious materials – as the material’s primary advantage. Not only does this reduce structural support requirements, but metal panels are easier and quicker to erect. This, combined with the fact that metal building systems are typically furnished by a single-source provider, lends a high level of control to panel fabrication, shipments to the job site and construction staging of materials. Photo courtesy of Zahner Co. 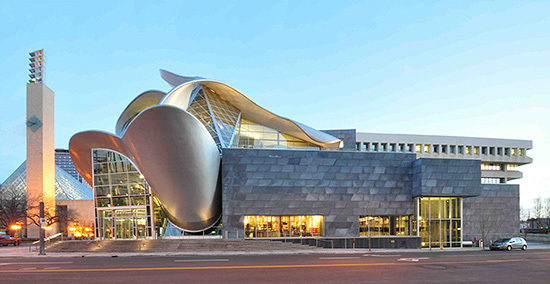 Demonstrating the versatility of metal, A. Zahner helped Randall Stout achieve his vision of undulating forms for the Art Gallery of Alberta in Edmonton, Canada. “Entire building projects can be engineered, fabricated and shipped in weeks, instead of months, often cutting construction time by 30 percent or more,” reports Dan Walker, P.E., assistant general manager, Metal Building Manufacturer’s Association, Cleveland. Cost-wise, metal is less expensive than glass curtainwall and is often on par with precast concrete, with the added advantage of lending a light, modern feel to the building architecture, according to B.K. Boley, principal of ADD Inc, now with Stantec, Boston. “Inevitably, when we are conceptualizing a new project, we look for material systems that can support and enrich our design vision, and we often end up with metal cladding systems because of their flexibility and potential beauty,” states Boley. “We have done projects that have used up to seven different colors, panel sizes and gloss levels on a single facade to help us achieve a sense of depth, variety and ‘hand-wrought’ humanistic quality that can exceed the offerings of terra-cotta or even wood cladding systems. 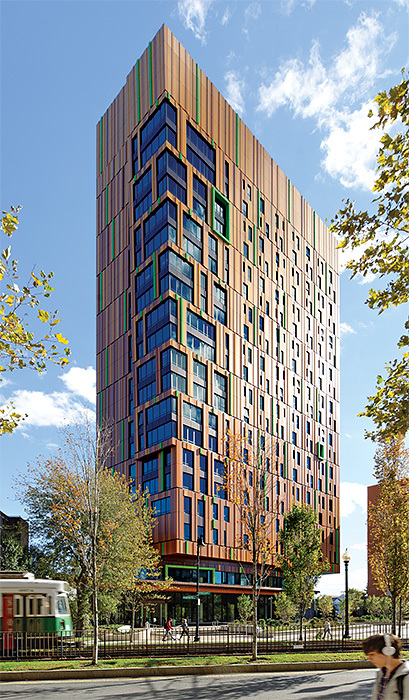 For example, Stantec’s colorful metal skin design for the Massachusetts School of Art and Design’s MassArt ‘Treehouse’ building utilizes more than 5,600 metal panels in assorted custom colors, shapes, depths and gloss levels to resemble the more deeply colored trunk of a tree, rising up to a lighter, more reflective tree top. Exploring the color potential of metal, Stantec compiled 5,600 metal panels in varying colors, shapes, depths and gloss levels to mimic the look of a tree for the Massachusetts School of Art and Design’s MassArt ‘Treehouse’ building in Boston.